Last year in Portland, we had a chance to test-ride a new midtail: the Bike Friday Haul-a-Day. 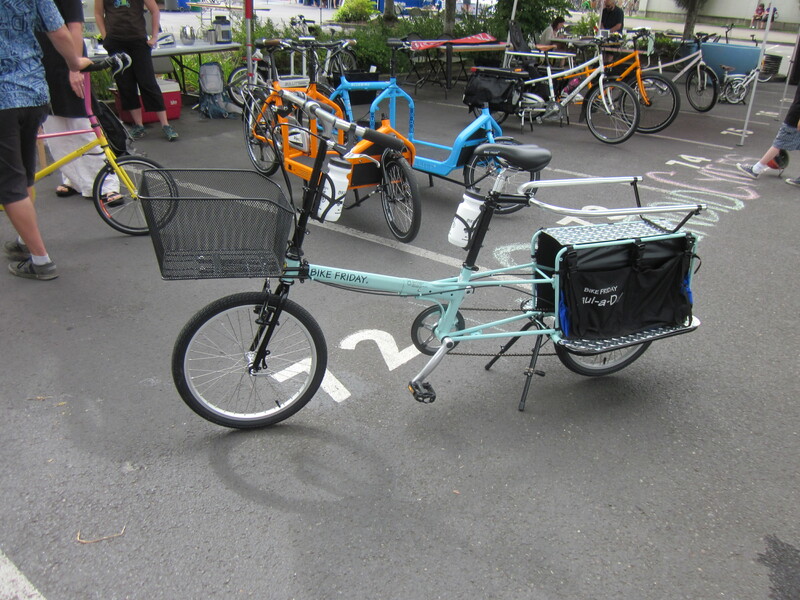 Midtails are not particularly common yet, even in the still-rarified world of cargo bikes, so the summary: they are shorter versions of longtails, which have the advantage that they can sometimes fit on bus bike racks, and the disadvantage that they can’t carry as much stuff. The Bike Friday Haul-a-Day now seems be occupying an odd space between the two. Our first cargo bike, the Kona MinUte, was a midtail. I get asked the “can I carry two kids on a midtail?” question a lot. The answer is that they are great for hauling one kid all the time, and can work for hauling two kids occasionally, assuming those kids are close in age, not too big, and neither one needs a child seat. However in our fairly-extensive experience, if you try to use a midtail for a two-kid daily commute, there will be blood. You can also carry an adult on the deck of a midtail (honestly, this is often easier than carrying a kid because adults usually don’t lunge around on the deck). The Bike Friday has a longer deck, so it seems to be somewhere in the middle of these two options. Bike Friday Haul-a-Day: Fun, versatile, squirrely. Bike Friday did a lot of things right that no other manufacturer of midtails has managed yet. And it’s also not exactly a midtail, as the bike has grown longer over time. However all Bike Fridays are fundamentally quirky in a way that will appeal to some people more than others. I am hardly the first person to write a review of this bike; check out Tiny Helmets’ perspective for the views of someone who has spent a lot more time on one. It rides like a bike. This is the key difference between a front loading box bike and a longtail: you have to learn to ride a front loader, and you can just get on an unloaded longtail and start riding. A midtail is like that but more so. There is really no learning curve, at least until you put squirming kids on the back. At that point everything changes no matter what bike you’re riding. In the meantime, being able to get on a bike and just ride it takes a lot of the intimidation factor out of moving to a cargo bike. The deck height relative to an 8-year-old, which just fits two older kids in a good mood. MinUte, with a heavy kid on the back, feels like it wants to tumble over during turns at speed thanks to the deck height, and it is very hard to keep the loaded bike upright while walking it. Yuba’s Boda Boda has smaller wheels, but decided to hike the rear deck up to nosebleed level anyway to fit a rear-rack BionX battery, so same problem. The Haul-a-Day has a 20” rear wheel and kept the deck low enough that even two squirming kids won’t make the bike tippy. The EdgeRunner’s comparably-low deck was a fantastic innovation and is what led us to finally buy a longtail. The Haul-a-Day is dramatically more stable because of this decision. The frame-mounted front basket, very impressive. the bike to carry cargo. The Haul-a-Day that we rode, however, came with a deep, frame-mounted front basket, made with a mesh fine enough that the basket didn’t need a liner. We could toss both my bag and my daughter’s hair bands in there safely. The frame-mounting means that the basket can carry tons of weight, and Bike Friday made the interesting and smart decision to use a narrow and deep basket, which means the Haul-a-Day remains narrow enough that it could probably even fit into those annoying wave racks that retrograde businesses are still installing. In addition there are the usual rear sling bags on either side of the deck, plus the deck itself. With these options, you don’t have to worry that you can carry the kids but not the groceries. The Haul-a-Day is relatively lightweight. With cargo bikes the term “lightweight” is always kind of a joke, right from the beginning, and it’s even more so when you consider that any family rider is going to pack on bags, kid seats or kid corrals, a front basket, front and rear lights, water bottles, at least one bell, not to mention another actual PERSON, no matter how little, and the gear always associated with little people. And yet. With midtails people often do have the ambition to carry it on a bus bike rack occasionally, so being able to lift it off the ground is a real issue. The bike we rode was not actually fully geared up as a family bike, but it had a lot of the relevant extras, and picking it up was still within the realm of possibility. 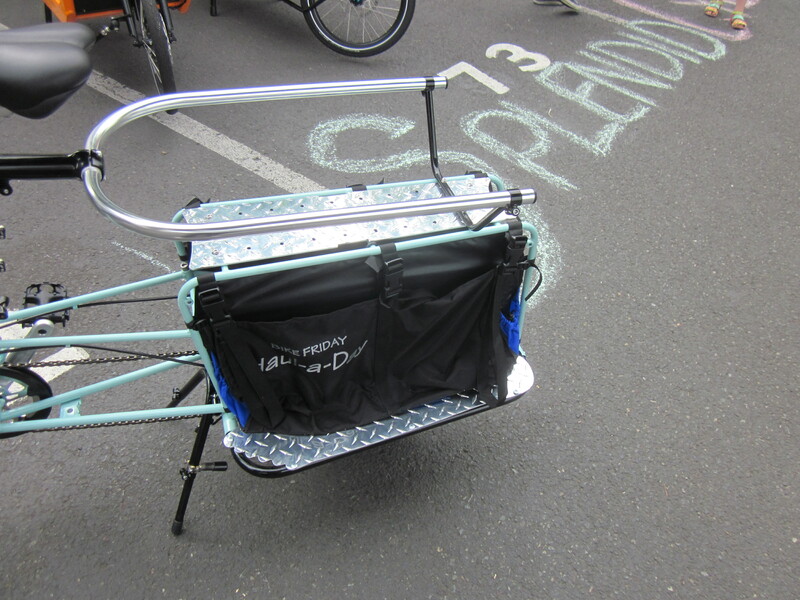 The same, alas, cannot be said of our big cargo bikes (although in their defense, they can carry more stuff/kids). The accessories are cargo accessories. 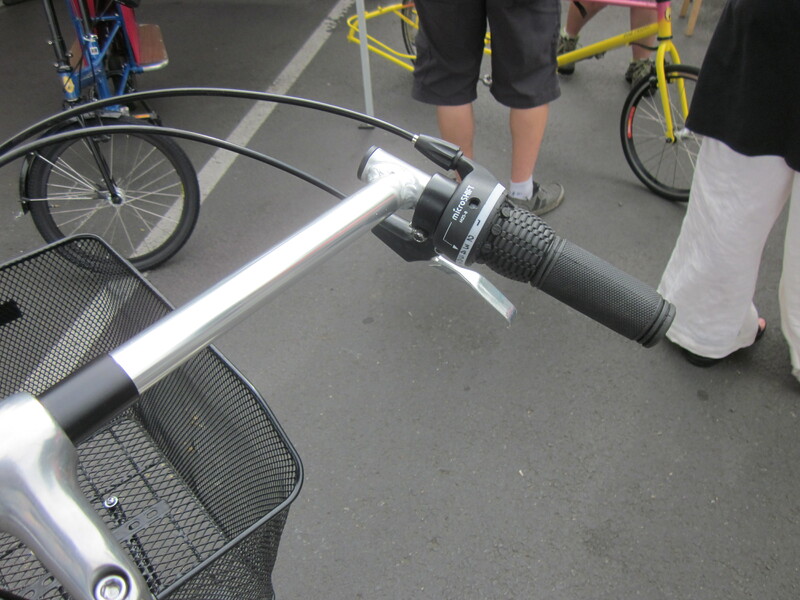 The center stand can keep the bike upright when loaded, for example. It fits riders of many sizes. 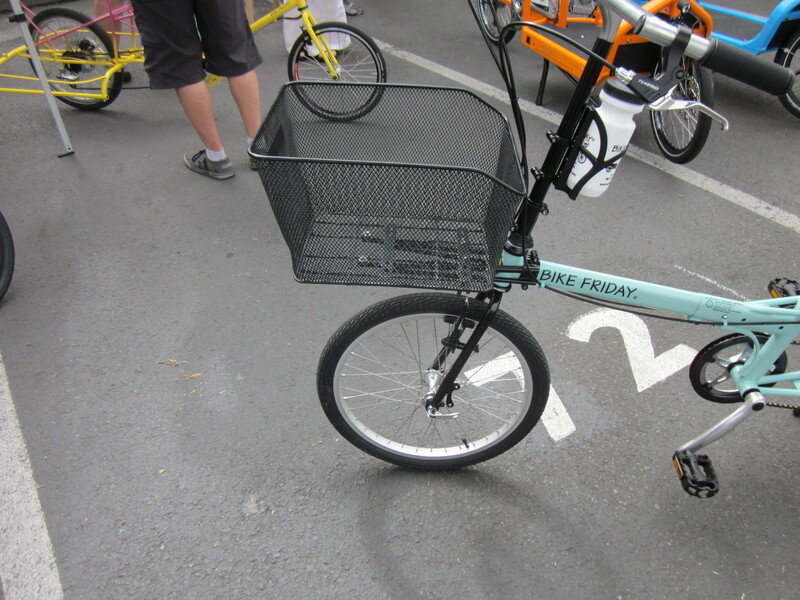 This is a really neat innovation of the Bike Friday design; it not only has a low step-over, for those with shorter legs, it is collapsible, for those who are short all over. That means that it is possible to telescope the front of the bike so that people with shorter arms can easily reach the handlebars. The Wheelha.us crew had the immediate insight that this meant that a kid could ride this bike, and now their 8-year-old has his own Haul-a-Day (my son has no comparable ambition; he is a San Francisco kid and he wants an assisted bike). It can be hard for the truly short to find a bike they can handle; this bike is a notable exception. Some midtails fit on some bus bike racks. The Haul-a-Day fits on Portland bus bike racks, for example, and there is photographic evidence that it also fits on the Amtrak racks. I know from experience that bus bike racks in both Portland and Seattle are longer than those of SF Muni, so caveat emptor: this doesn’t necessarily mean that the Haul-a-Day could fit on any bus bike rack. Maybe it could, maybe it couldn’t. Still, if you live in Portland, or take a lot of Amtrak rides, you’re in pretty good shape for multi-modal transportation with a Haul-a-Day. The Haul-a-Day is customizable. Bike Friday is a family-owned hobbyist/local type of business, and that means that they are more-or-less making their bikes by hand. There are a number of standard options on the website with respect to gearing and accessories, and the experience of others suggests that there are a number of unconventional options available to those who ask. They seem like genuinely nice people who want you to have the bike that you desire. Update (see comments below): The Haul-a-Day is now available with a BionX electric assist. Great option. The price is not outrageous. In January 2015, a Haul-a-Day is running $1200-$1400 on the Bike Friday website, depending on specifications (some assembly required). It rides like a folding bike. The Haul-a-Day is not actually a folding bike. However it has a design feature common to folding bikes, which is a single tube between the front and the rear of the bike. In contrast, a typical diamond frame has two tubes: one stretches from below the handlebars to just below the seat (this is the top tube), and the other runs underneath it from below the handlebars to the cranks and pedals (the down tube). Having that second tube makes the bike handle better, because it has more lateral stability. A folder usually feels somewhat twitchy, because the frame is moving around a bit at the same time that you are trying to steer. (Living in California, I perceive this effect as equivalent to riding in a very, very mild earthquake.) It’s not a deal-breaker or anything, but given the choice I prefer a different design. As others have pointed out, it can also making figuring out how to lock up the bike challenging, because the frame lacks an obvious hole to put the lock through. And this design choice is a clear tradeoff for other, desirable things: for the same reason that the bike is twitchy, it can easily be fitted to short people in a way that other bikes cannot be. instant stopping power of hydraulic disc brakes, and found that I needed to be more cautious with the standard Haul-a-Day brakes. Not everyone can ride this bike. While it’s stupendous for the small, the height limit for the rider is 6’4” and the weight limit for the rider is 220lbs/100kilos, which will exclude those at the taller and heavier end of humanity. Update (see below in comments): There is, however, an option for those who weigh up to 260 pounds. This is the kind of as-needed versatility that Bike Friday is known for. This is the deck and the corral that they disliked: bumpy and open in the back. known. The deck, for reasons that mystify me, is made with a bumpy diamond pattern on metal, and my son (who is quite skinny) complained vociferously that it hurt to ride on it. My daughter wasn’t thrilled either. The kid corral, which Bike Friday calls the Whoopee-Deux (and here is the place where I can no longer avoid my standard complaint about the ridiculous naming conventions, random capitalization, and unconventional grammar endemic to cargo bike manufacturers), is open in the back. Which: what? If you put two kids on a cargo bike, one of your biggest and most legitimate fears is that they’ll get into a shoving match and one of them will go right off the back of the bike. Other manufacturers’ versions of this accessory are enclosed in the back, for good reason. As with the EdgeRunner, the lovely low deck that makes it possible to load up on kids without feeling a hint of instability also means that older kids can drag their feet on the ground. If you make your kids test-ride enough bikes as cargo, they will start dragging their feet as a way to brake the bike just to mess with you. Under ordinary circumstances, they may do it out of boredom or distraction. Adding foot rests can help with this issue, but there are no guarantees. As with all longtails and midtails, you need to give some thought to balancing the load. Front loading box bikes are easy; you throw whatever in the box and ride off. Bikes that put stuff on either side of the wheels often need some jiggering to keep from falling to one side. As yet, no longtail or midtail manufacturer provides a weather cover for the kids carried on the back, Bike Friday included. Here in drought-stricken California, this is kind of a non-issue. In places with more interesting weather, it may be the difference between occasional and regular riding. And even though there isn’t much need for weather protection here, it is still much easier to get our kids out the door in the morning with the promise of being able to ride underneath the cover. Bike Friday is a weird company. It’s not a bike manufacturer in the usual sense of the word; it does everything in-house and acts more like a hobbyist shop. That comes with some advantages in terms of customizing the bike as desired. And it comes with some disadvantages because things change on the bikes, sometimes without warning, so an accessory that fit a model made one year may not fit the same model that was made in a different year. If you live in Eugene, I imagine it’s not much of a problem, given that you can head over in person and get the right part. Here, people with Bike Fridays have testified that they need to have a lot more patience. Update: Although I (and many other people we know) were not aware of it before, there is a local dealer in San Francisco for Bike Friday, Warm Planet Bikes, formerly located at the Caltrain station and a lovely shop. Getting local support may be tricky. Bike Friday does not seem really interested in working with local dealers, and in fact competes with bike shops by selling their bikes direct to consumers on their website. 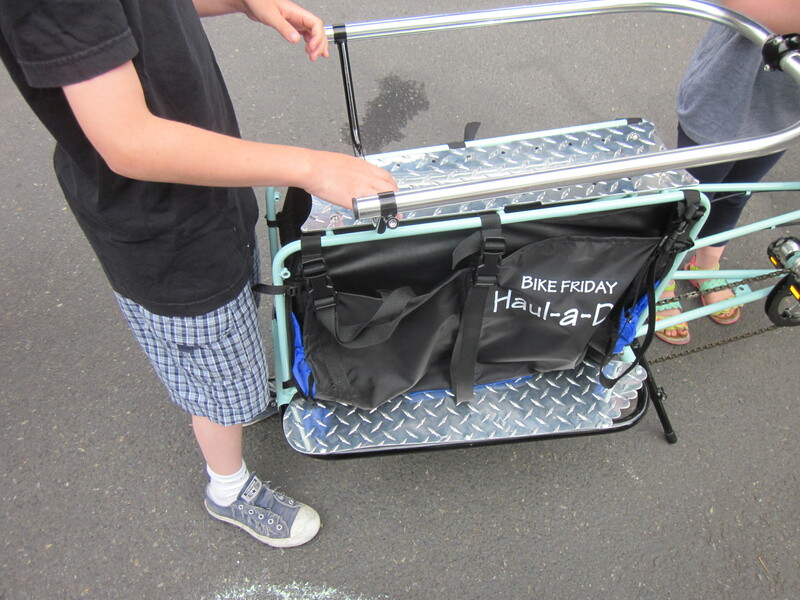 More recently, Bike Friday created a Kickstarter campaign that sold Haul-a-Days for less than the price that local shops could charge. As a result, there aren’t many local bike shops that carry Bike Fridays, because there is no way for them to make the numbers work. This became an issue locally when the Bike Friday Tikits were recalled due to fall hazards—San Francisco isn’t Eugene, so finding a local shop to repair what has always been a semi-custom bike, with parts that changed in different years, became a real issue for people who owned them (and who, as mentioned above, weren’t familiar with Warm Planet). In many localities, this kind of bike may be better suited to people who plan to work on their bikes themselves. At this point, their patience had not yet been exhausted by the close quarters. 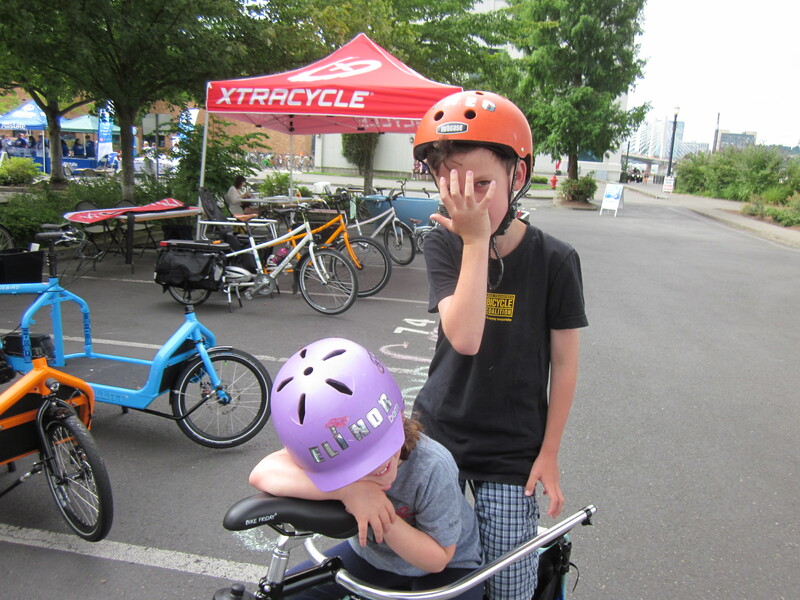 We are out of the midtail and longtail market ourselves until our kids are ready to ride completely on their own. Right now our kids ride their own bikes sometimes and have us tow both them and their bikes when they get tired. Matt is eager to get back on his MinUte when he is a solo commuter again, because midtails make it possible to have a bike that rides and parks normally, but can carry enormous piles of stuff, or a kid, when needed. If that describes your life right now, then the Bike Friday should be very appealing, especially if you’re short. (And if you are a child who wants a cargo bike, it’s almost your only option.) Midtails and probably the newer not-quite-longtail Haul-a-Day are very fun to ride, because they are so accessible. While the Haul-a-Day isn’t the right bike for our current needs, I’m delighted to see that a bike so versatile is now on the market. Great post as usual. I love your reviews, and it was your review of the stokemonkey that greatly influenced my decision to buy it for my Xtracycle. The only thing I disagree with is your statement about the lack of local Bike Friday support in San Francisco. Warm Planet Bikes is a Bike Friday dealer and they are right on Market street. I boughty Tikit there five years ago. They work flawlessly with Bike Friday on service issues and I know rhis in-depth as I have had a few. Bike Friday has even shipped my Tikit back to them on more than one occasion for warranty repair. They picked up the shipping cost each time and packed the bike up for me for free. Oh, and they also happen to be an xtracycle dealer as well. I also bought my FreeRadical there and they installed it on my old mountain bike. Great shop. I believe they have Haul-a-days and Edgerunners as well in stock if anyone wants to go rest ride. PS: Apologies for the spelling, etc., above. That’s very helpful to know. Not everyone knows that they are doing this (I didn’t) but I will pass it on. I’m looking at the Haul-a-day as a single rider bike with the option to carry one kid. My daily ride right now is an assisted Madsen, awesome for the school run and groceries but a bit of a boat when I’m riding solo. It is available with a heavier frame for riders over 220 lbs. I’ve ordered one in the December Kickstarter but I won’t get it until this summer. I ordered one on the Kickstarter too. My son is 10 and is now at the Middle School, so I don’t pick him up everyday anymore.Goodbye Boda Boda my friend. Also, he always wants to ride the Bike Friday tandem when we bike on the weekends. Regarding the assist, it seems like anyone interested in an assist should be able to put a hub motor on a Haul-a-Day. Gocarlite.com, the original source for my electric assist (which I bought secondhand), has wheel kits all the way down to 16″ size (don’t tell your kids :)). I see, from one of the testimonials on their site, that they’ve put an assist on a Bike Friday triple. Very useful information about the smaller wheel assist, although unfortunately it doesn’t help the kids–last time I checked CA law still limits the use of assists to riders aged 16 years and older. Thanks for such a in-depth review. At Bike Friday, we encourage honest reviews and post reviews on our website, the good, the bad and ugly. We also owe you great thanks for allowing us to take your photo in Portland. It graces the cover of our brochure (since what you were wearing accented the color of the bike perfectly)! I just wanted to mention a couple of things. The Haul-a-Day you rode in Portland was a proto-type, and as a just-in-time manufacturer, we can make changes to the bike as we move forward and learn more. That said, the current Haul-a-Day (which will be the one delivered to those above who ordered throughy Kickstarter) has a longtail. The midtail rear has been discontinued so there is plenty of room for everyone or anything. We do offer heavy rider upgrades for riders up to 260 pounds, as well as upgrades for individuals who plan to carry heavier loads. The basic frame has been enhanced and it does alleviate some of the squirrelly aspects you mention. Also, as of this week, we offer a BionX electric assist for the Haul-a-Day. So many of these changes have come about from the great input we’ve received from customers and others who have ridden the bike. We really do appreciate the oportunity to learn and move forward. Thanks for reaching out to so many people! And, as mentioned above, we do have dealers in the Bay Area. Warm Planet in San Francisco and Chain Reaction in Redwood City are Bike Friday dealers. Thanks for this information–I appreciate it and I’ve updated the review to reflect it. I have learned to expect that I won’t get the details exactly right the first time (and to not have a lot of ego about that). I thought it would be a bit gauche to point out that we were on the brochure, but the kids love that picture. Thanks for adding your thoughts. I would love to see you (and the HaD) if you are in town! We might even have a new loaner bike then, so you should definitely come. For context, my spouse rides a (kid free) Surly Cross Check on his commute, while I use an assisted xtracycle edgerunner for hauling the 4 ft tall 70 lb 5 year old on the school/work commute (along with all of his and my various stuff). Spouse uses the “El Camino” along with me on weekends for kid and grocery hauling. Our experience is that the smaller front wheel makes the ride more bumpy, but not more squirrely, if that makes sense. Our EdgeRunner remains solid as a rock even with two squirmy passengers, but I do notice the potholes more. I ordered before on Kickstarter as well. Great review, btw. I agree that it is both fun and versatile.